food network addict: Don't Wanna Go to the Gym! Don't Wanna Go to the Gym! On Saturdays, I normally go to the gym at 11 a.m. (or so), but I can't seem to pry myself off the couch. Instead, I'm watching Gina Neely sing to her spices. Why? The 11 a.m. gym time usually worked out well; I'd make it back just in time to catch Ina, but Barefoot Contessa has been noticeably absent from the weekend block lately. (Fear not, Ina lovers: think she's just on a little hiatus until fall). Sooo, I guess I have no excuse. I've even seen this episode of Down Home with the Neelys already. And the way their show is shot kinda makes me sick (shaky cameras are standard on these Gordon Elliott shows). All right. Here I go. Off to the gym. haha... i know. and something to plug it in with! okay, going to the gym for real now. I'm the SAME way, J! Why do we do this to ourselves....LOL! Does your gym have treadmills or bikes with tv's? Mine does and I'd go and sit on the bike forever and watch my saturday morning cooking shows while burning the calories. I've never biked so far in my life unless I was watching FN! 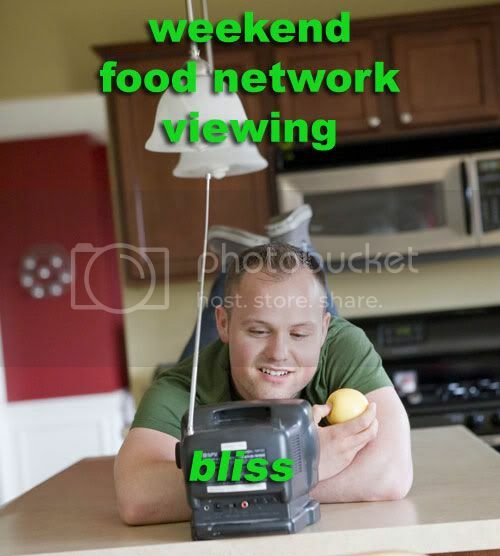 that picture epitomizes addiction to Food Network. Use it in place of the haggard images of some girl chefs up top. Love the Alfafa thing you got going on too. Great pic man, Love the kitchen, I am so jealous. I have been caught missing the gym for Ina, she is just that addicting!!!! I just saw Aunt Sandy's show this morning (Sunday). Oh my Gosh she is making COCKTAILS in her slow cooker now!!!!!! You have go to be kidding me. I wanna watch it at the gym too but scared to turn it on in case someone sees it and thinks to themselves, "damn fatty is addicted to food" lol....they wouldn't understand I need my "in the kitchen fix". I had to get over Ina but now I have to deal with Jamie and Anne Burrell not being on!! What are they doing over @ FN? Fietti and Declisi"oh-no" were on this morning, blech! If they take off Giada or Rach I am thru! My current gym doesn't have the personal TVs, and I don't think I'd be ballsy enough to ask the staff to change one of the big TV's channel to Food Network. i know she is for some people, but Paula Deen wouldn't be motivating for me. I'd just wanna stop and eat. LOL! You sure you aren't just depressed because I left DC?!? Watching the Spice Fairy at work is one of my favorite pastimes on Saturday. One of their first "Road Tasted" shows was in Denver. . . the sweet potato pound cake is all that and a bag of chips!! I actually went to Neely's in Memphis this weekend as I was passing through town. The bread they brought was disappointing -- basically brown & serve rolls -- but everything else was excellent. And their desserts aren't in the ridiculous $5-$6 dollar range like most casual-dining places. I found their BBQ sauce surprisingly spicy.